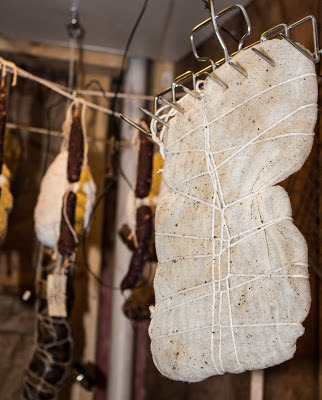 Only Fergus Henderson, author of The Whole Beast, would think nothing of it to include a salad recipe for salted pig's liver curing for five weeks in a section called "Starters." I would also venture most people wouldn't plan a salad five weeks in advance, but here we are. So I ordered a whole Berkshire pork liver from Blue Rooster Farm about three weeks ago. It's a big, smooth, slippery thing...or, it was, before it got packed in a salt and sugar cure. 1.) They have a lot of nooks and crannies and folds and flaps. I really had to wiggle and massage the curing salt into all the little pockets and indentations to make sure it would cure evenly. 2.) Livers release a ton of water. Perhaps they don't hold water as well as skeletal muscle, but this liver produced a lot of liquid. It actually dissolved the curing salt and made a highly concentrated brine. Not wanting corned liver, I poured all this liquid off and reapplied the cure. I'm not too worried about this, as Fergus said it might happen. 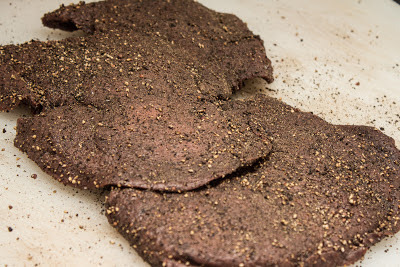 So then the liver was rinsed, patted dry, and rubbed with a copious amount of cracked black pepper. Wrapped like a liverish babe in swaddling cloth, it'll age for another two weeks. I'm curious about the evenness of the cure, as livers are like lumpy mounds, rising high in the center and tapering off into a thin edge. My guess is that this will make for very dry edges after 3 weeks, which might just need to be trimmed off. But for now it's hanging in my curing room on the prongs of a stainless steel bacon hanger. Nothing to do now but wait and plan the rest of my salad. What temperature do you cure it at? Thanks! I cure it at 48-55 F.
How did it turn out? I've been meaning to do this for years! Raw, sliced thin, the liver was very mild and not gamey at all. When I seared it, it soften in texture but took on a stronger, minerally flavor. Plus, once the heat left the sliced liver, it became incredibly tough and brittle. So I used it raw, shaving it like bottarga. It made some nice savory biscuits when added to dough. I would like to try this again. I'm curious if I smeared it in lard, as you would the cut end of a leg of prosciutto, would that help to hold some moisture? Or just seal it up and cause it to rot. How do you plan to store this? Refrigerator? You can indeed find cured liver salami in parts of southern France, such as the Carcassonne region, where it is called saucisse de foie. As you say, it is mixed with standard pork mince in various quantities depending on the artisan maker. It is a delicious treat although doesn't keep as long as a 'normal' cured sausage and can be an acquired taste. Note that they also make a similar sausage to cook, also a mix of mince and liver. Finally, Carcassonne is home to a cured liver based salad, which you may want to try. It is highly local and even a few miles away, no-one will have heard of it. It is sometimes called salade languedocienne, although that name is also sometimes used for a more complicated affair. See below my family recipe, which, although deceptively simple, is delicious.